Sunflower is one of the most popular crops in agriculture. Sunflower is an annual plant that belongs to the family of astroids. This product is used after the processing process. In the end, the meal and sunflower oil are produced. Sunflower has excellent healing and nutritional properties. It is used in cooking, animal husbandry, folk medicine. It consists of: betaine, choline, proteins, carbohydrates, vitamin A, carotene and other useful substances. Seeds contain oil, linolenic, lignoceric, oleic acid. How useful are these substances to the body? • Vitamin A is involved in the assimilation of proteins in the body, helps slow the aging process, and helps in the successful formation of bones and teeth. • Vitamin E helps to remove toxins from the body, participates in the normalization of reproductive function. • Lecithin has a positive effect on the cardiovascular system of a person, participates in the formation of erythrocytes and hemoglobin, improves the work and activity of the brain, strengthens the walls of blood vessels. • Fitin improves the liver, helps with the prevention of liver and biliary diseases, improves the nervous system, with its help successfully activated fat metabolism. • Betaine helps active generation of energy, helps to improve the digestive system, does not contribute to fat deposition, improves acidity. 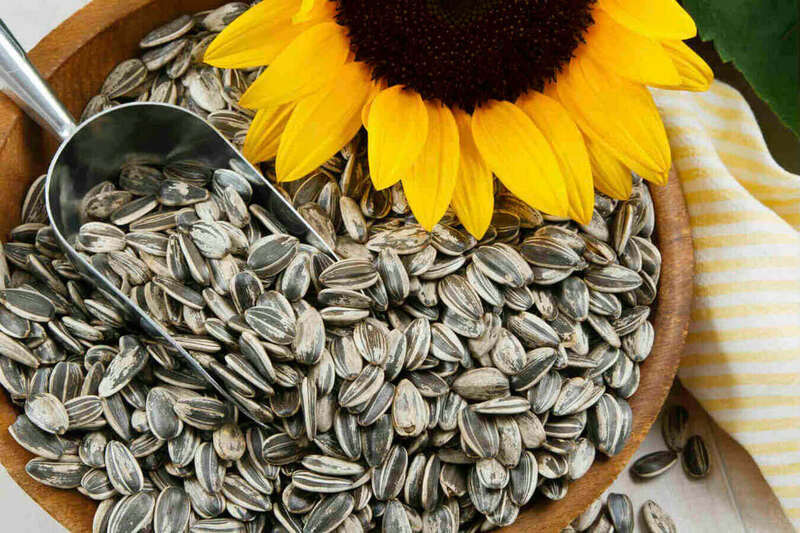 • Sunflower seeds are recommended for people who suffer from problems with arterial pressure, help with the need to withdraw sputum, have a beneficial effect on the cardiovascular system and strengthen the blood vessels of the body. Also, seeds help with allergies and disorders of the nervous system. Sunflower oil is also used in the manufacture of ointments, medical plasters, oil solutions. It is worth noting that all parts of sunflower have useful properties, use for various purposes and stems, and leaves, which also have a positive effect on all organs and systems of the body. This product is also used for the treatment and prevention of various diseases. Also with its help lower the temperature, treat open wounds, cuts and burns, excite appetite. The schrot, which is a product of sunflower processing, is used for feeding cattle in agriculture. With its help, the chickens, cows, sheep, fish, pigs and other animals are successfully fed. Schroth in its composition has a high protein content, which helps the active growth of livestock. In addition, other vitamins and amino acids also help to grow a healthy animal. Also use sunflower to produce high-quality oil, which is used for cooking. • the temperature rises to 55 ° C or more as a result of the activity of thermophilic bacteria and as a result of developing processes, the acidity increases to 30-35 mg KOH per 1 g of fat, the seed defect is 100 percent. Sunflower seeds are safely stored only at a humidity of less than 7% and a temperature of no higher than 10 ° C. At a humidity of 8% and a temperature of 20 ° C they can be stored for 1.5 months, 10 ° C for 4.5 months, at 1 ° C for more than 6 months. In the event that it became necessary to purchase this raw material, it is extremely important to choose the right company to sell. Of course, you can write in the search "sell sunflower" and find many similar companies. At the same time, quality can not always be high. Our company sells sunflower wholesale and large lots for a long time. Affordable prices, fast delivery, the possibility of obtaining advice - this is only part of the benefits, in connection with which you need to contact us. Buy a quality product you can quickly and inexpensively.